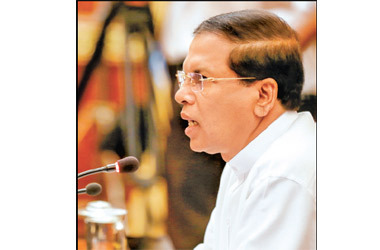 The government is firm on taking whatever action it deems appropriate to meet the Geneva proposals within the framework of the Sri Lankan Constitution, President Maithripala Sirisena yesterday told leaders and top members of political parties in the country. The President had called this meeting with the country's political party leaders to ascertain their opinion regarding how Sri Lanka should go about meeting the Geneva proposals. Leader Mano Ganeshan, Pivithuru Hela Urumaya leader MP Udaya Gammanpila, Communist Party Leader D.E.W.Gunasekera, MP Chandrasiri Gajadheera, Nawa Sama Samaja Party leader MP Vasudeva Nanayakkara, LSSP leader and former All Party Representatives Committee Chairman Prof. Tissa Vitharana and Ministers Champika Ranawaka and Nimal Siripala de Silva were among the participants. President Sirisena emphasised that although it had been suggested through the media by some parties that the proposals in question had to be fully rejected, the government must face them. "It can be arranged and I shall hold a series of further all-party representatives meetings to gather your opinion regarding the proposals and how Sri Lanka should go about them as a sovereign democratic nation that respect human rights, truth and justice," he said. "There current resolution is quite different in terms of its content in comparison to those resolutions that came intermittently on March 22, 2012 , March 21, 2013 and March 27, 2014," the President said. "It will be important to draw your attention to the proposals' main points," he said. President Sirisena requested that they may submit their opinions regarding steps to be taken in view of the resolution concerned and the results of their deliberations in writing to the Presidential Secretariat within a two weeks after each meeting.